Sometimes, a little bit of do-it-yourself love can do just fine in place of getting completely new flooring. This is especially the case for hardwood floor staining, where a good stain job can transform a room, home, or building into something that feels like a completely new place. Before you start your project, do your homework and make sure that you’re taking all the steps necessary for a beautiful staining project, as well as staying safe yourself. Take a look at some quick tips below. It’s important to remember that the same stain will look different on different types of flooring. This is because the original color of the wood will come through to influence the newly-stained floor. For example, a red oak floor simply won’t look the same as a maple floor with the same stain. This might seem obvious, but it’s a note that bears emphasis! Trust us on this one – you will sorely regret it if you don’t put some time and patience into sanding your floor before you stain it. In most cases, imperfections and mistakes during the sanding process will be rather noticeable after the stain is applied. For this reason, it’s important to make sure that you use the same sanding grits and sanding patterns over the course of the whole area, to ensure that the final product is smooth and consistent. If you want to know – without any doubts – what your stain will look like when it’s all said and done, it’s highly recommended to test out a sample area before taking the plunge and staining the whole area. 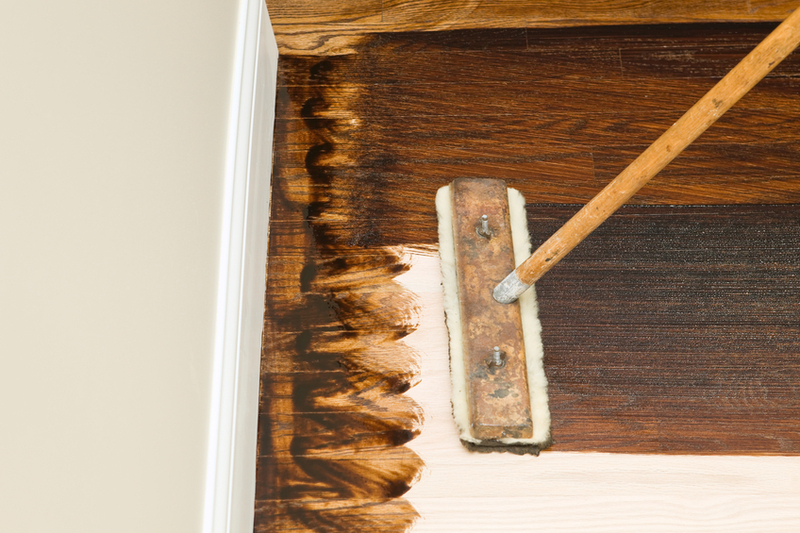 You can sand off and test a small area of the room, or buy separate boards so that you don’t have to re-sand and re-stain if you’re not a fan of the final product. Stay safe during this process! Since you’ll be dealing with chemicals, make sure that you’re wearing protective gear. A carbon filter dust mask can help to prevent you from inhaling dangerous fumes from the stain and dust from the sanding process. Dust-free latex gloves will ensure that you don’t get chemicals on your hands. To be on the safe side, make sure you’re wearing old or throwaway clothes in the event that you get a bit dirty. If you’re looking for some new hardwood flooring, give us a call at (407) 262-7979.